SK Telecom in China is testing an innovative new shopping cart system called the Smart Cart that would revolutionize the way grocery shoppers handle coupons. To maximize the service, shoppers must have the Smart Cart app installed on their mobile phones; they can use it to create a shopping list, access product information and see store coupons. 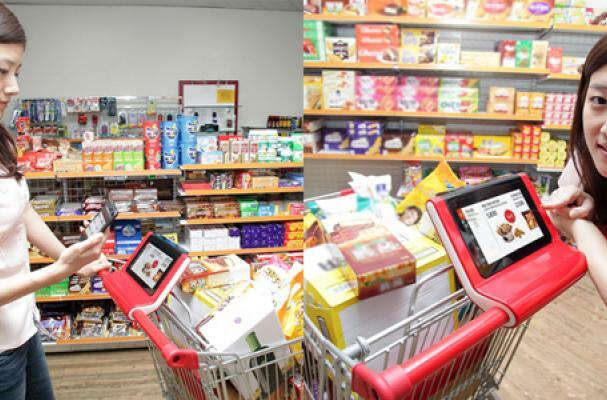 The shopping cart, which boasts a built-in tablet, syncs with a shopper's smartphone, detecting her location within the store to display real-time information pertinent to her position such as coupons, tips and product information. Where the Smart Cart service gets really interesting, however, is at the checkout counter. There, the tablet will display any available coupons, a list of items purchased and the shopper's membership points. Would you use such a service if it was available in the U.S.?